Burlington has lots of nicknames: Queen City, BTV and “The People’s Republic of Burlington,” come to mind. On Tuesday, October 15, Burlington Mayor Miro Weinberger called a press conference to announce another one he really hopes will catch on: New England’s Gigabit City. The moniker refers to the speed at which Burlington Telecom’s fiber-optic network can transmit data. A typical internet connection is measured in megabits; most broadband users probably operate at speeds between two and 20 MB per second. A gigabit is 1000 megabits. In other words, Burlington Telecom can provide users with an unusually fast connection. For years, the story about BT has been about its financial problems and mismanagement; now the city is hoping to shift that conversation to show off what the network can actually do. “We think it’s time to move forward with this conversation,” Weinberger told the crowd of 50 or so gathered for the announcement at Dealer.com. The city is getting help from a national initiative called US Ignite, which has chosen Burlington as one of its partners. The nonprofit promotes and provides operational resources for a growing number of cities with super-fast fiber networks, such as Chattanooga, Tenn., and Kansas City, Kan. US Ignite executive director William Wallace joined Weinberger at the press conference. He said the group selected Burlington because of its fiber network and the presence of institutions such as Champlain College and the University of Vermont that could help spur the development of applications that take advantage of the city’s gigabit connection. Weinberger and Wallace will explain more about US Ignite, and what it could mean for Burlington, at the 7th annual Vermont Tech Jam, this Friday and Saturday at Burlington’s Memorial Auditorium. 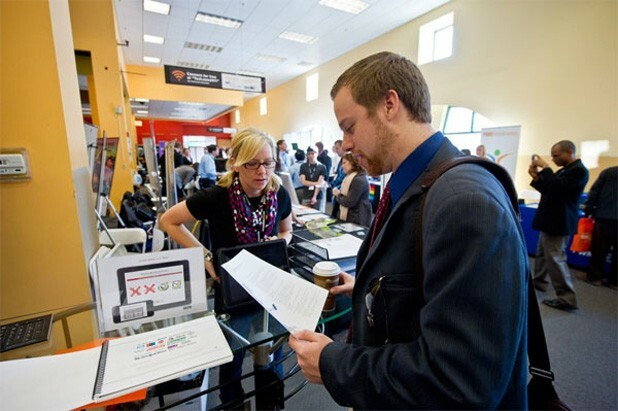 Seven Days organizes this free job fair and tech expo with the Vermont Technology Alliance. The city of Burlington is sponsoring the event, in part to highlight its newly announced US Ignite connection. This Tech Issue of Seven Days is also timed to coincide with the Jam. Every year we use this opportunity to explore the technological tools and trends that are transforming Vermont — for better and for worse. In the “Local Matters” section, digital media manager Tyler Machado talks with Vermont’s social-media-savvy state police, who invite you to follow them — on Twitter. Staff writer Kathryn Flagg reports on recent efforts to open up governmental data for civic hacking projects. In some cases, those efforts require big changes to legacy computing systems. Upgrades can be risky. In “Code Blew”, Ken Picard investigates some of the ways in which the state has failed on the IT front; the architects of Vermont Health Connect might have done that research before they started building. Though state government has seen its share of high-profile IT setbacks, there are a number of Vermont-based niche technology companies succeeding in big ways on a national and even international level. Seven Days staffers spoke with seven of them in “Only in Vermont”. On a smaller scale, assistant arts editor Megan James profiles Lisabeth and David Sewell McCann, two atypical techie entrepreneurs, in “Storytellers Who Sparkle”. The “media-cautious” Charlotte couple is wary of digital media and its effects on their children, but they love a good story. Their subscription-based, online audio storytelling service has spawned one of the top kids podcasts on iTunes. The Sewell McCanns would fit right in at StoryhackVT — Vermont’s first-ever digital storytelling competition kicks off at the Tech Jam on Saturday morning. So would Bina48, aka “the world’s most social robot,” whose story is straight out of science fiction. You can read all about her in this week’s cover story or chat her up yourself at the Tech Jam on Saturday, October 19; she and her caretaker, Bruce Duncan, will be speaking at 1 p.m. on the 242 Main Stage. Find more information about their presentation, along with a complete Tech Jam schedule and a list of its 80-plus exhibitors, in the 24-page guide at the center of the issue and at techjamvt.com. And stop by the Tech Jam. It may just change the way you think about Burlington — and Vermont.